LAHORE – The Himalayan black bear at the Lahore Zoo successfully bred for the third time in Lahore Zoo, giving birth to two healthy cubs. Though the cubs were born on January 28, 2011, Zoo veterinarian Dr Zaib Mahel told Pakistan Today that they could not approach the bear for security reasons. The babies were born after a gestation period of about eight months. 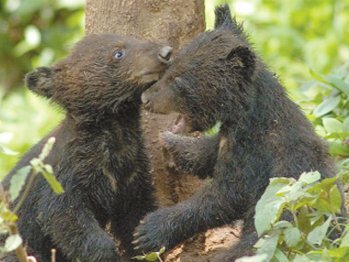 The Himalayan black bear usually gives birth during hibernation when living in the wild, and emerges only when the cubs are around two months of age. During this period the mother does not eat or drink, as she is in hibernation and stores enough body fat to last her the winter. However, in captivity, bears do not hibernate as they are confined to one place, but their body functions automatically reduce their rate of metabolism resulting in a decrease in their diet. Even then, the zoo management has been giving her the feed, which Dr Zaib says the bear was eating, however very slowly. “After about two months, the bear is expected to feel more comfortable in emerging in public with her cubs,” says Dr Zaib. The black bear is a threatened species due to deforestation. The Lahore Zoo management claims that it is making attempts for the conservation of this species. In year 2009 two cubs were born which are still present in the Lahore Zoo. The management says they are trying their level best in giving a comfortable environment to the mother so that it can rear the cubs without any fear.